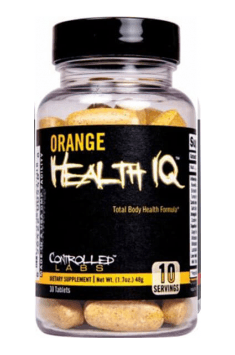 Controlled Labs Orange Health IQ is the most advanced pro-health formula supporting the condition of the organism. The supplement contains as many as 19 carefully selected ingredients, which facilitate the work of the key organs and regulate the activity of all the most important systems of the organism. There are highly standardized plant extracts, which were combined with essential, unique nutritious compounds (niacin, lutein, lycopene, coenzyme Q10). The uniqueness of the preparation is highlighted by the presence of probiotic bacteria strains, which very rarely are present in the composition of complex supplements. The preparation is recommended to everybody who wants to take care about health in a complex way. It has been designed especially for sportsmen and people prone to large physical effort. Their organisms need solid support and natural help. The supplementation will work well also during the periods of weakness and recuperation. Reduction of inflammations and antioxidant protection is an indispensable element of prophylaxis of civilization diseases. It is achieved thanks to the extracts from Boswellia Serrata and Curcuma Longa root as well as coenzyme Q10. Boswellia Serrata reduces inflammations and alleviates pain symptoms as effectively as the drugs belonging to the group of nonsteroidal anti-inflammatory drugs (NSAIDs). This plant provides unique chemical compounds called boswellic acids. They are natural inhibitors of 5-lipoxygenase enzyme, which is responsible for releasing leukotrienes inducing inflammation. Boswellic acids decrease the concentration of many markers of inflammation (TNF-alpha, TNF-beta, IL-1beta). The effect of Boswellia Serrata is supplemented by curcuma extract (Curcuma longa) and curcuminoids, isolated from its rhizomes. They block the spreading of inflammatory processes by inhibiting the secretion of pro-inflammatory enzymes. They are also effective in neutralizing free radicals. Additionally, curcumin increases the level of glutathione – the most important antioxidant in the organism. Extracts from Boswellia Serrata resin and curcuma work well especially in the ailments of the movement apparatus – pain in bones, joints, spine combined with swelling and inflammation. They do not destroy articular cartilage, but nourish it and secure from harmful effect of many enzymes. Coenzyme Q10 is a compound resembling vitamin, engaged in the process of the production of cellular energy taking place in mitochondria. It improves organism’s efficiency, adds energy and prevents fatigue. It is an exceptionally strong antioxidant – counteracts lipid and protein oxidation, sweeps the excess of free radicals from the organism and supports regeneration of other antioxidants (mainly vitamin E). Increasing the supply of coenzyme Q10 is especially recommended to people complaining about fatigue and decreased energy level. Support for the heart and circulatory system is incredibly important to maintain optimal organism’s efficiency and minimize the risk of heart attack or stroke. There comes with help garlic extract contained in the preparation, which provides an exceptional substance, called allicin. Allicin improves the work of the circulatory system and thanks to the ability to widen blood and coronary vessels it promotes proper blood flow. It has anti-aggregative effect – it prevents clotting of platelets, which may form clots dangerous to health. It decreases the concentration of cholesterol and triglycerides, preventing atherosclerosis. Moreover, it demonstrates the ability to lower excessively high blood pressure. Health of the urogenital system is guaranteed by cranberry extracts, Sabal palm extract and lycopene. Cranberry has antibiotic properties. It prevents the adhesion of bacteria to mucous membranes of urinary system cells and by the same token it facilitates their elimination from the organism. Benzoic and hippuric acids contained in cranberry fruits acidify urine creating the environment unfavorable for harmful microorganisms. Regulation of the digestive process largely depends on proper intestinal microflora and appropriate amount of gastric juices. The preparation contains the composition of three important probiotic bacteria strains (Bifidobacterium Lactis, Bifidobacterium Longum and Lactobacillus Acidophilus), which after colonizing the intestines improve the absorption of nutritious substances, restore proper bowel movements and eliminate gastric ailments. Ginger extract in turn stimulates the secretion of gastric juices, positively influencing the time of empting the stomach and proper gastric-intestinal mobility. Protection of the liver and facilitating detoxification are essential to quickly remove all dangerous substances from the organism. It was proven that one of the most effective compounds detoxifying the organism are contained in Silybum marianum extracts. These are sylimarin complexes, which regenerate liver cells and secure them from the toxicity of almost all dangerous chemical compounds. Organism’s detoxification is supported by the extract from goldenseal, which has a detoxifying effect and shows incredible effectiveness in removing metabolites of pharmaceuticals from the organism. It is said in certain circles that taking the preparation with goldenseal may even influence the tests detecting drugs in the organism. A few studies proved that drugs in combination with goldenseal are not detectable thanks to fast and effective detoxification. Niacin contained in the preparation is also conducive to removing heavy metals and pharmaceuticals. Additionally, it accelerates the breakdown of ethyl alcohol, thanks to which it shortens the time in which liver cells are exposed to its harmful effect. Support for the respiratory system is ensured by mint leaves extract. It has expectorant effect, mitigates cough and prevents infections around upper respiratory tract. Additionally, it effectively freshens breath. Mental peace and more effective brain work does not need to take place at the cost of health and thanks to synthetic chemicals. In many studies it has been proven that valerian present in the supplement decreases anxiety and has antidepressant effect. Phytochemical compounds contained in the preparation activate GABA receptors and influence certain serotonin receptors. Thanks to this, they tone the nervous system, bring about relaxation and the improvement of mental well-being. Similar effects are caused by niacin – one of the most important vitamins engaged in the synthesis of the “happiness hormone”, i.e. serotonin. Niacin has antidepressant properties and prevents sleep disorders. Improvement of the condition of hair and nails is possible after supplementing a diet in field horsetail extracts. Field horsetail is a real repository of biologically active compounds. Flavonoids, organic acids, plant sterols and primarily fumed silica contained in it support hair growth, maintain their proper structure and strengthen nails. Regeneration of adrenal glands is essential in fast pace of life and omnipresent stress. The supports of adrenals with appropriate nutrients prevents the disorders of their activity, which appear as fatigue, energy drop, difficulties in dealing with emotions and lower immunity (the so-called adrenal fatigue). Rhodiola rosea root extract regulates hypothalamic–pituitary–adrenal axis (HPA), increases resistance to stress and normalizes the work of the nervous system. Proper vision is conditioned by i.a. proper lutein supply, which cannot by produced by the organism on its own. The preparation contains the optimal dose of lutein, which protects eye retina from damages caused by the activity of free radicals and UV radiation. Moreover, it decreases eye dryness and oversensitivity to artificial light. Summing up, Orange Health IQ is the only product with such a wide spectrum of activity. It may be used both by women and men. Rich composition makes the preparation able to replace many other products. Orange Health IQ 30 tab. Initial (first serving): Start by taking 1 tablet to assess your individual tolerance. Regular use: Take 3 tablets per day with a meal. Complex formula supporting health at all possible levels. The supplement is recommended as widely understood health prophylaxis. The recommended dose is 3 tablets, which should be taken with a meal. A natural preparation promoting the health of gastrointestinal tract. Supports the fight against infection.